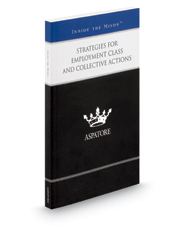 Strategies for Employment Class and Collective Actions provides an authoritative, insider's perspective on key tips for assisting clients through negotiating conditions in a settlement. Featuring experienced partners from law firms across the nation, the book guides the reader through collecting documentation and evaluating when it is best to settle. These top lawyers offer specific advice on developing relationships with experts and witnesses, encouraging clients to use wage and hour policies, and helping clients stay up-to-date on various class action certification requirements. From fluctuations in wage and hour regulations to the benefits of early action, these experts stress the importance of educating clients on labor laws and taking preventative measures against policies at risk for litigation. The different niches represented and the breadth of perspectives presented enable readers to get inside some of the great legal minds of today, as these experienced lawyers offer up their thoughts on the keys to success within this ever-present field.